Good morning everyone, who is looking for a great place to eat this weekend? Well if you are, Alex here to tell you who made USA Today’s Top 10 Restaurants in Tampa Bay. Located on Davis Islands, Estela&apos;s Mexican Restaurant features dishes that include rice and beans, while they highlight such offerings as enchiladas, burritos and tacos. The family-owned Kojak&apos;s House of Ribs dates back to 1978, barbeque spare ribs, chicken and hot links. Drinks include beer, wine and sangria. 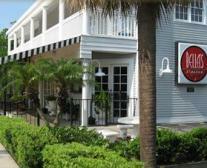 The restaurant lies in Tampa&apos;s Bayshore Beautiful region. Click here, if you would like to read the full article on Tampa’s top 10 restaurants from USA Today. Have a wonderful weekend and enjoy some great food at one of the great restaurants mentioned above. Check back with us next week for more information on Things To Do In Tampa Bay!